Every two years the International Coach of the Year trophy is handed to the proud directors of a manufacturer at the Busworld exhibition amid camera flashes and congratulatory speeches. Before that can happen, there is the rather less glamorous process of deciding which coach is most worthy of the prize which is, along with the sister International Bus of the Year trophy, the most valued of all international accolades. The selection process is a long and thorough one which begins with one of the 22-strong Jury volunteering to organise a Coach Euro Test event. Each of the Jury members represents a leading magazine in their respective country and this time it was the Swedish representative, Anders Karlsson of Mantorp Media & Konferens, who volunteered to provide the contest which results in the winner of the International Coach of the Year 2018. The current holder, selected following the previous Coach Euro Test held in Plovdiv, Bulgaria in 2015, was the Iveco Magelys Pro. Anders Karlsson is both a long-standing automotive journalist and a successful writer of crime fiction who somehow managed to arrange for the event to be based at the Mantorp Park motor racing circuit, ‘the home of Swedish motor sport’, near the city of Linkoping. I can’t imagine the difficulty I would encounter trying to secure Silverstone for such a venture, so well done to Anders for obtaining the use of the excellent facilities there. Unfortunately he did not manage a favourable deal with the weather which was unrelenting rain throughout the three-day testing process, only brightening during the final day of proceedings when the coaches were making the long journey home and the jury was indoors, deliberating over the decision before the members cast their votes. 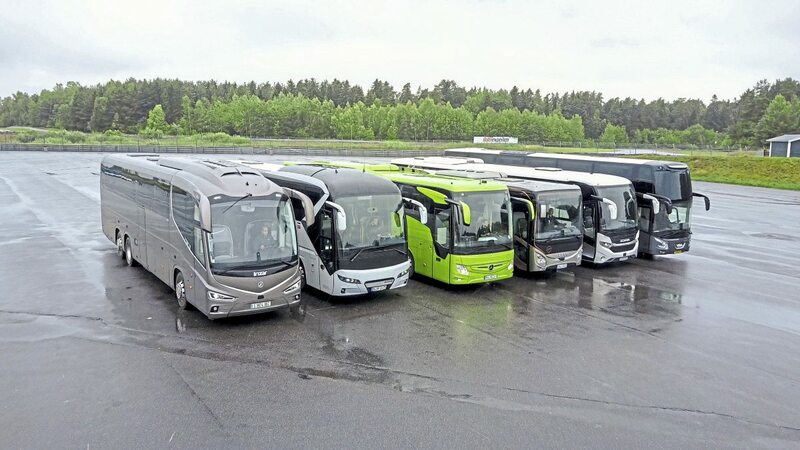 For a variety of reasons linked to events in the Swedish calendar, the usual May/June date for the test was dropped this year in favour of the first week in September which had the advantage of enabling a number of new models to participate, though it also led to an extremely busy calendar, with the dates slotted in among the various manufacturer’s pre-Busworld press launches. The result was an extremely strong field of six candidates – it was nearly seven – all but one of which were models that are offered in right-hand drive for the UK and Irish markets. 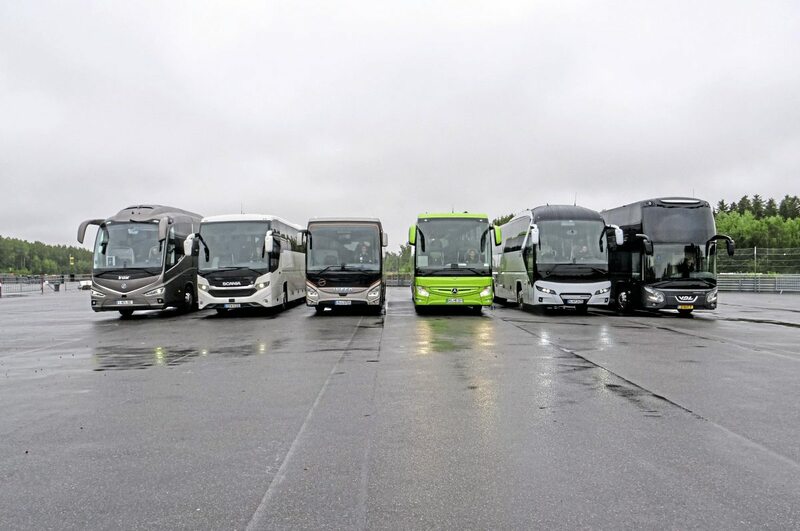 The six participants, in alphabetical order were the: Irizar i8 Integral; Iveco Evadys; Mercedes-Benz Tourismo; Neoplan Tourliner; Scania InterLink HD; and VDL Futura FDD2-141. 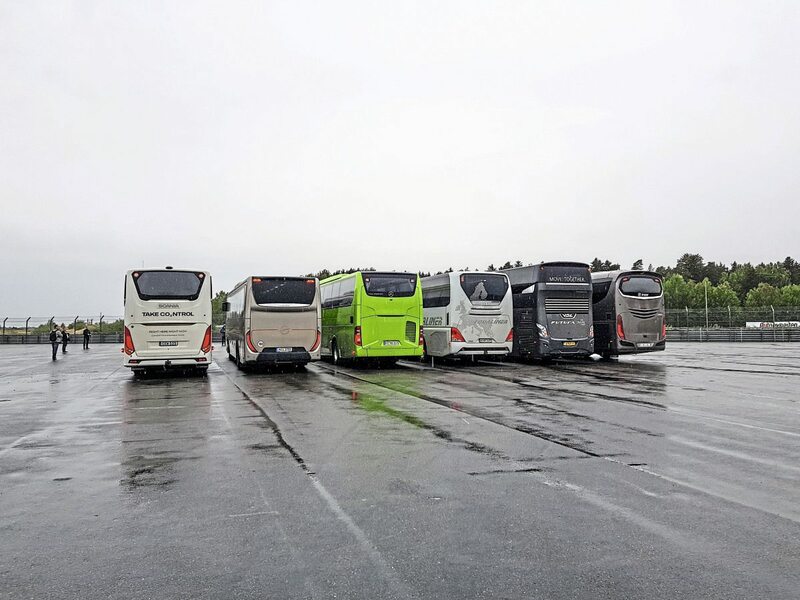 Clearly, they represented the full gamut of coaching applications, from the flexible budget coach through to the top-end corporate tourer with the added complication of a double decker and an equal split between two- and three axle variants to exercise the judge’s powers of objectivity. The event relies on the support of sponsors (who cannot be companies entered in the competition). 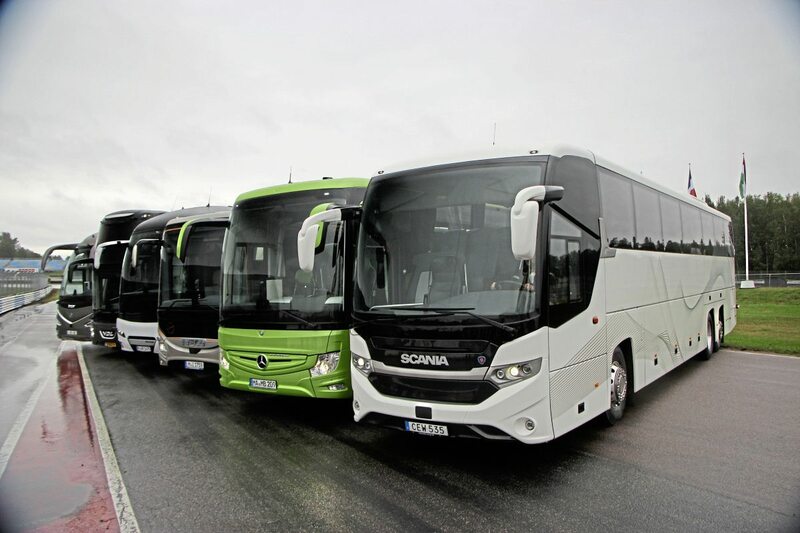 Very long-standing relationships with Busworld and ZF, who sponsored the two evening dinners, were maintained, together with the contribution of Mantorp Media & Konferens. An important element of proceedings is the inclusion of all participants throughout the event. Thus all of the manufacturers’ representatives are entitled to sit in on the other’s presentations (though they cannot ask questions during them) and they are also welcome to travel on the other candidate’s coaches, though not to drive because the pressures on time required a rota to be followed to ensure all jurors get a turn on every coach. This year’s route covered approximately 36km between Mjolby and Bankeberg and took in both country roads and motorways on which a feature were the 60-tonne articulated truck combinations so popular in Sweden. The field represented an unusually strong array of products and, as ever, the immense differences between them and the applications for which they are intended made differentiating them a tricky task. It has long been the claim of the Jury that the competition is one with a winner and no losers. Unlike other juries such as those covering the truck, van and pick-up markets, only a winner is announced, with no second and third positions revealed. 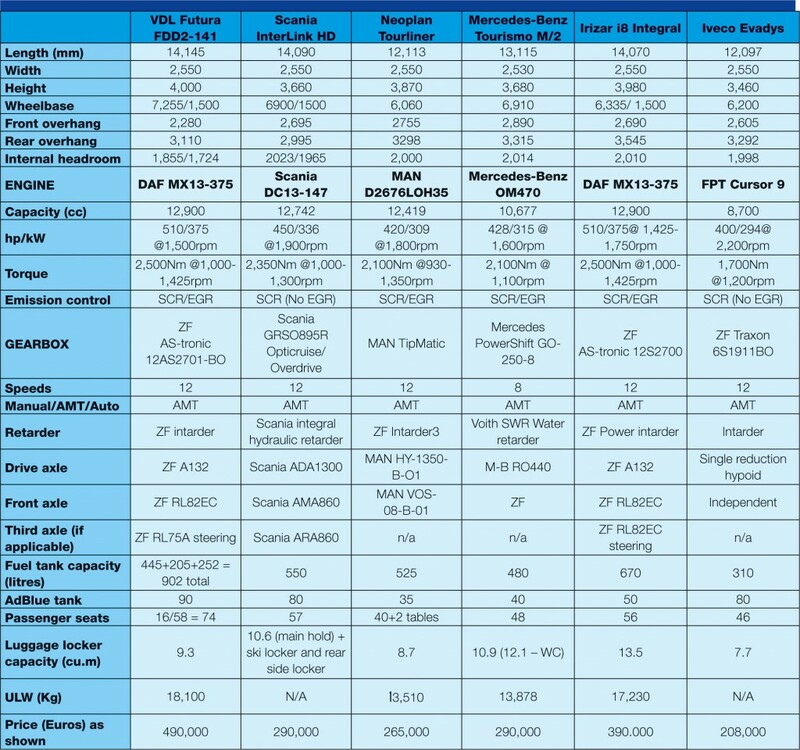 Hopefully, while there are huge marketing and prestige opportunities generated for the victor, all other participants also benefit from their participation through coverage in member magazines as well as the chance to compare products and network during the Coach Euro Test itself. Will it be the last Coach Euro Test of its kind you wonder? 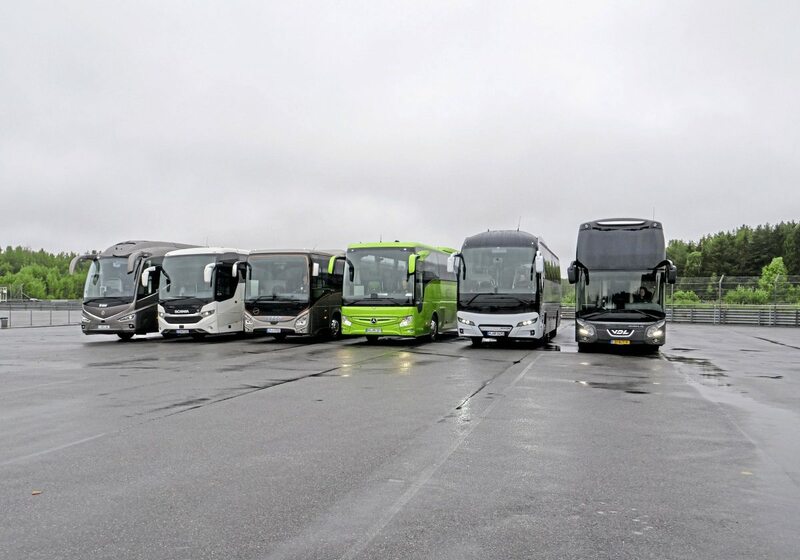 With Paris and other cities keen to promote electric coaches it may be that an all diesel-fuelled line-up of participants becomes less common, though it is hard to see diesel’s disappearance altogether for a considerable time yet. 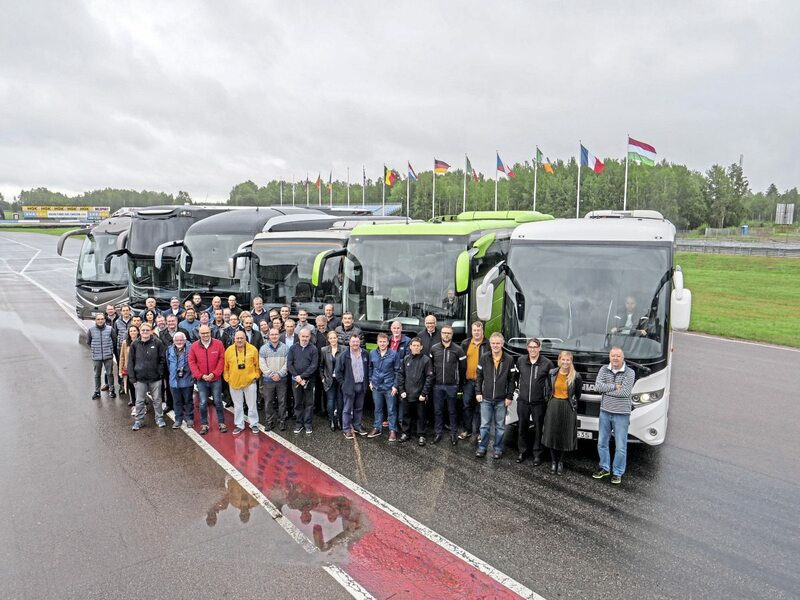 Hopefully I have not given too many clues in this article about which coach emerged the victor because this will not be announced until the award ceremony on the press day of the Busworld exhibition in Kortrijk, Belgium on 19 October. Next year’s Bus Euro Test will take place in Zagreb, Croatia when the successor to the International Bus of the Year 2017, the Solaris Urbino 2 will be chosen. Which would you choose as winner? 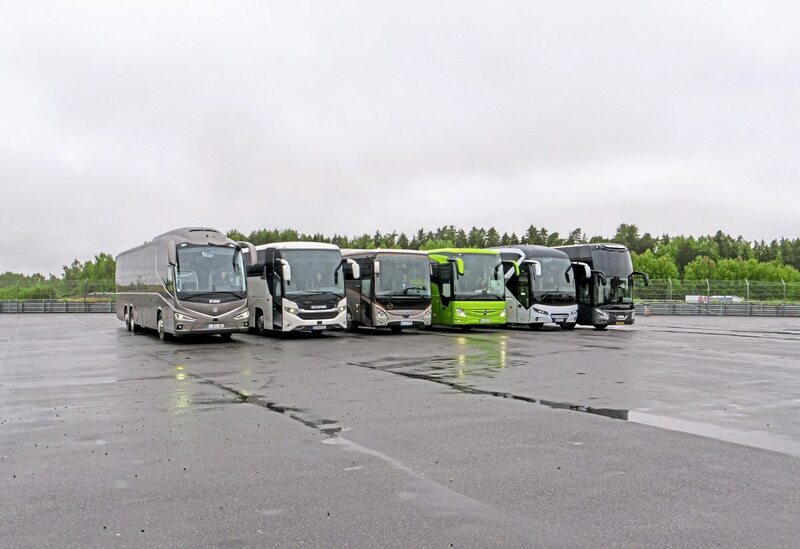 The judges for International Coach of the Year (shown above) will announce their decision at this year’s Busworld, in Kortrijk, Belgium, open to the public between 20 and 25 October. But which would you choose? Go to the Bus & Coach Buyer Facebook page and take part in our fun poll. You can pat yourself on the back later if the judges agreed with you…!